Jennifer Block is the “whack-a-mole” of childbirth journalism. She periodically pops up in mainstream publications to defend homebirth with a stream of mistruths, half truths, and outright lies. Then, when it is pointed out that she has been deliberately misleading, and sometimes altogether dishonest, she disappears, only to pop up several months later to issue the same falsehoods and disappear again. Now that Michelle Golberg has exposed Block’s “bad faith approach” in a follow up article in The Daily Beast, and I have challenged Block to a public debate, she has made herself scarce. It’s hardly the first time. So once again I challenge her to a public debate, and maybe this time she’ll have the intellectual integrity to participate. Homebirth advocate Jennifer Block must be grateful to RH Reality Check for getting her off the hook. They deleted the data that I posted so she did not have to address it. Block has decided to respond publicly, this time on Babble.com Who’s winning the homebirth debate? But “Dr. Amy” is real. I sat with her, face to face, for nearly three hours at a Starbucks off Route 1 south of Boston a couple years ago. She is not a researcher, not an epidemiologist, and probably not on anyone’s payroll; she is an obstetrician-gynecologist who left private practice more than a decade ago because, she told me, she’d had it with HMOs and wanted to spend more time with her four kids (she let her license lapse in 2003, according to the Massachusetts Board of Medicine). And for some reason, which I never quite got to the bottom of, she believes in every cell that Home Birth Kills Babies (that’s in fact the title of her most recent post on her new site, The Skeptical OB), and no amount of research evidence will convince her otherwise. Interestingly, Ms. Block, in yet another 3 page screed, doesn’t bother to present any actual evidence. That’s not surprising. There is none. I challenge you to a public debate on the safety of homebirth in any neutral forum of your choosing, whether print, other media or a public appearance. 1. All the existing scientific evidence (including the Johnson and Daviss BMJ 2005 study) shows that homebirth with a direct entry midwife has nearly triple the rate of neonatal death for comparable risk women in the hospital. 2. American direct entry midwives do not meet the standards for licensing in ANY first world country. They do not meet the standards in the Netherlands, the UK, Canada, Australia, anywhere. 3. The Midwives Alliance of North America, the group that collected the statistics for the BMJ 2205 study) has continue to collect safety statistic from 2001-2008. They are currently hiding those statistics from the public. They should be required to release those statistics so women can decide for themselves if CPMs are safe practitioners. 4. According to the World Health Organization, the US has one of the lowest levels of perinatal mortality in the world, lower than Denmark, the UK and the Netherlands. I welcome publicly debating you or any other homebirth advocate in any neutral setting. I’m not holding my breath though; neither you nor any other homebirth advocate will agree to a public debate because you know my data is correct and my case is airtight. No one in the world of homebirth advocacy can risk the embarrassment. How about it, Ms. Block? If you are so sure about what the scientific evidence shows, you should welcome an opportunity to discuss it point by point. Perhaps the folks at Babble.com Slate might be interested in hosting the debate. After all, don’t women deserve the opportunity to analyze both your claims and my claims and reach their own conclusion about what the scientific evidence shows? P.S. I’m not holding my breath. If past is prologue, Block wouldn’t dare participate in a public debate. It’s time once again for the mole of childbirth journalism to disappear before she gets whacked. Addendum: Jennifer Block has graciously proved my point for me. Instead of responding to Michelle Goldberg’s evisceration of her “bad faith approach” and instead of agreeing to a public debate with me of the scientific data and state, national and international statistics, she has popped up on her own blog … and disabled the comments so she can’t even be questioned or corrected! Jennifer Block knows she cannot defend her mistruths, half truths and outright lies in any forum where she could be questioned. 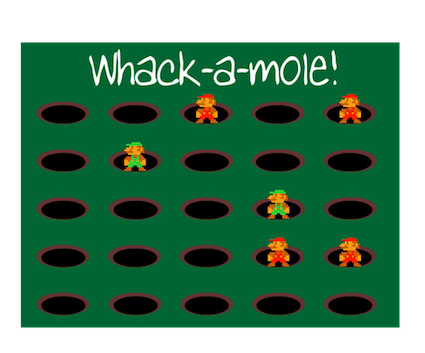 So like the mole in whack a mole, she drops out of sight and pops up again in a place where no one can challenge her. It’s a tacit admission that she cannot defend her claims.